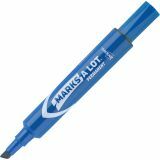 Avery MARK A LOT Regular Desk-Style Permanent Marker, Chisel Tip, Blue, Dozen - Permanent marker is designed to work on almost any surface including cardboard, metal and plastic. Works well both indoors or out. Durable 3/16" chisel tip writes in a variety of line widths. Rich, dark low-odor ink is quick-drying, nontoxic, water-resistant and rub-resistant. 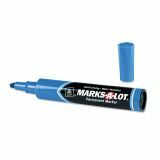 ACMI certified (conforms to ASTM-D 4236).